Exhibition of lino-cut, woodblock, etched and Chine-collé prints. Shown at the This Is Not A Gateway (TINAG) 3rd, Festival On Cities. This new, ongoing series of landscapes employs and variously combines – lino cut, woodblock, etching, embossing and one-off Chine-collé prints, and utilises as its point of reference cloud imagery. To some degree Couchman is paralleling cloud motifs, which she has observed in temples, public architecture and large courtyard homes, (siheyuan) across China. This traditional subject, being usually depicted in stone or wood, materials that are in acute contrast to the ethereality of actual clouds. This mirrors the printmaking process where the cloud is carved in lino or wood or etched in copper. The inadvertent starting point for these works was Couchman noticing, as the plane in which she was travelling descended towards the as yet unrevealed Beijing metropolis, a thin layer of bright yellow cloud, delineating a relatively fine line of material through which the aircraft quickly passed. From the ground nothing of this curious narrow band was visible, only a clear blue sky. There is some irony here in the application of the English expression ‘every cloud has a silver lining’, which suggests that everything bad has its positive, if perhaps at first hidden, aspect. In the present case the matter is reversed, the clear blue of the sky being discreetly penetrated by an invisible layer of tangerine haze. It is difficult to see the ‘silver lining’ in this ominous yellow vision. 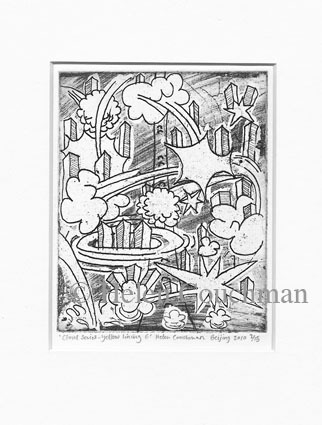 Couchman’s depictions of clouds are somewhat stylized, presenting age-old Chinese imagery in a modern form that owes much to the technical devices and conventions employed in western comics. Her pairing of Chinese wood and stone clouds with references to 20th century cartoons and design have allowed for a fantasised depiction of a grey and yellow cityscape.